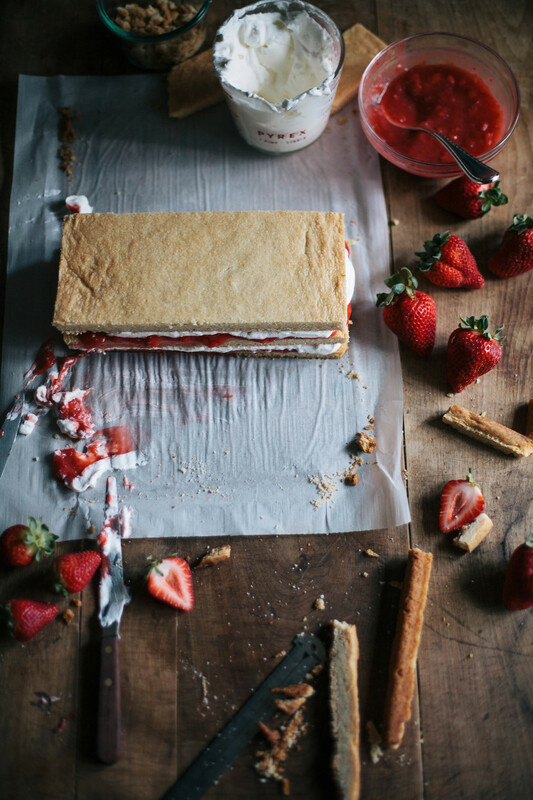 Strawberry Icebox Cake — always with butter. 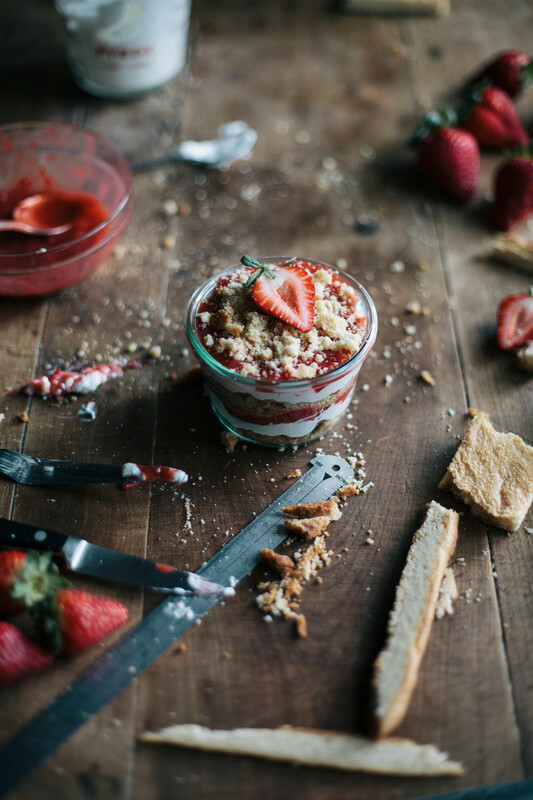 In a blender, puree strawberries until smooth. Transfer to a medium saucepan and stir in sugar and cornstarch. Cook and stir over medium heat until thickened. Cook and stir 2 more minutes. Stir in lemon zest, juice and butter. Remove from heat. Transfer to a bowl, cover surface with plastic wrap. Chill until completely cool. Oven 375 degrees F. Line a 9x9x2 rimmed baking sheets with parchment. In a stand mixer, beat the butter, shortening and sugar together until light and fluffy. Add in the zest and vanilla. Beat in the eggs one at a time. Mix until well combined. In a separate bowl, whisk flour, baking powder and salt. Add into the sugar mix. Mix until just combined. Separate into 4 equal portions. Place the first portion onto a baking sheet and press into an even, thin layer. Bake for about 10 minutes, until just set. Don't let get brown, since you are going to freeze it. Repeat 3 more times to get 4 cookie sheets total. Let cool completely. Then remove pan and parchment. Place one cookie sheet back on the baking sheet. Spread 1/3 of the whipped cream on one of the cookie sheets, covering all of the top. Spoon 1/3 of the sauce over the whipped cream, as evenly as possible, but making sure not to mix the layers. Top with a cookie sheet. Repeat. Once done, loosely cover with plastic wrap and freeze overnight. Cut into squares of your desired size and serve frozen. Life has changed once again, a new job and a new home. What is that, 7 or 8 moves now in the past 2 years. Ridiculous. But now the puppy has an actual yard to play in, instead of only being able to go outside on a leash. He is such a better pups now. Before he would get so bored and would just destroy anything and everything because he could never run around. Now it's only the occasional bad behavior which is so be expected from only being 9 months old. Christmas, the cat, has a new friend too, Sydney. A curious and bold cat that constantly tests his boundaries with the dog. The new job is working out too. I'm still just a hostess at a restaurant, but now a much busier one where I actually have things to do. This change seems to be for the better.